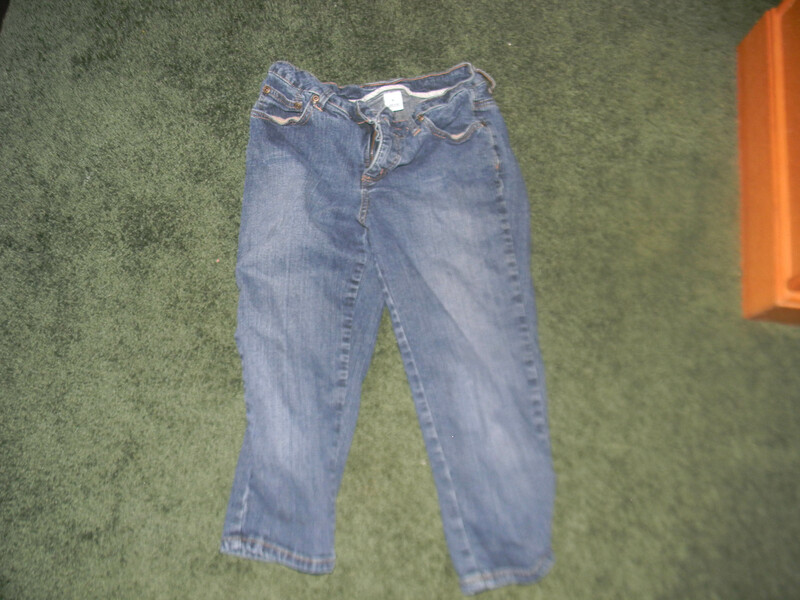 For over 7 years I have stored away a pair of jeans. They were probably the most expensive jeans I have ever purchased so even though they were to small I couldn’t part with them. 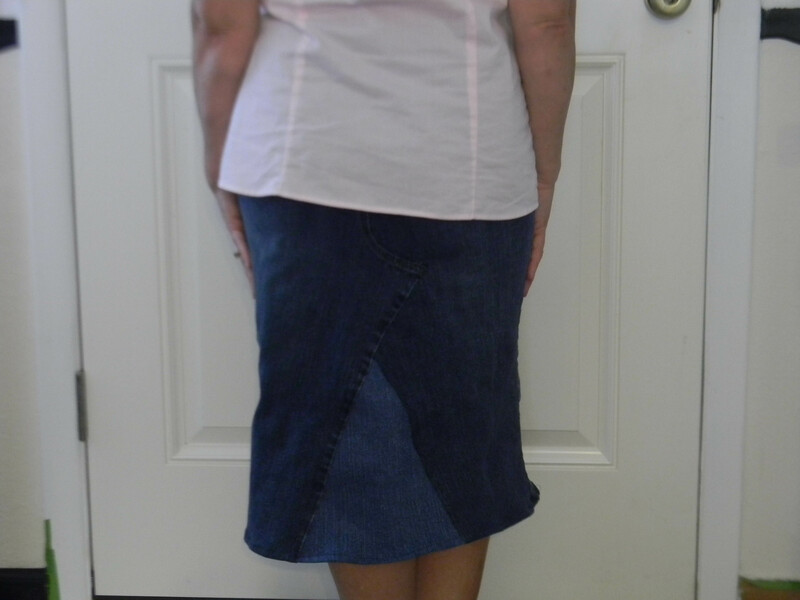 When I pulled them out to make this skirt I knew they were small but a size 14 girls!! I want to wear more skirts but the problem is I can only find elastic waists or dress skirts. I have not even been able to find a pattern I like. 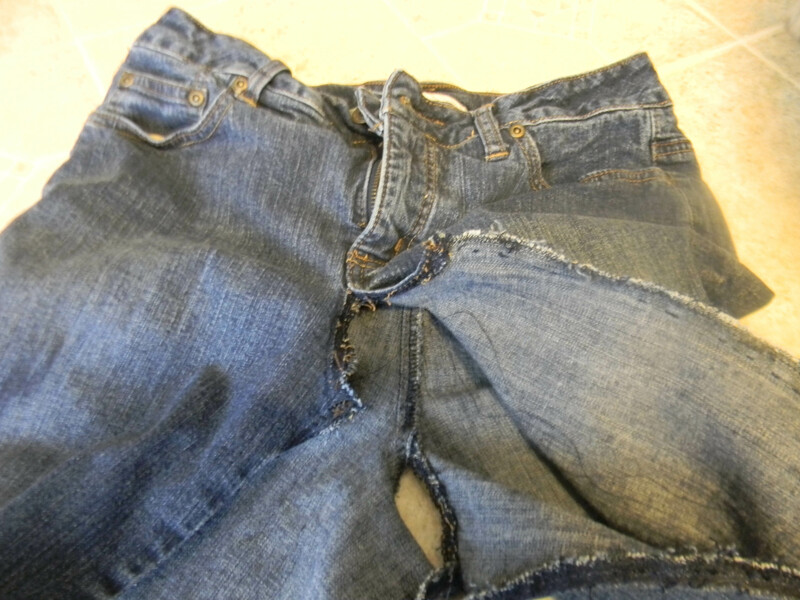 So I decided to save my money and reconstruct my jeans. 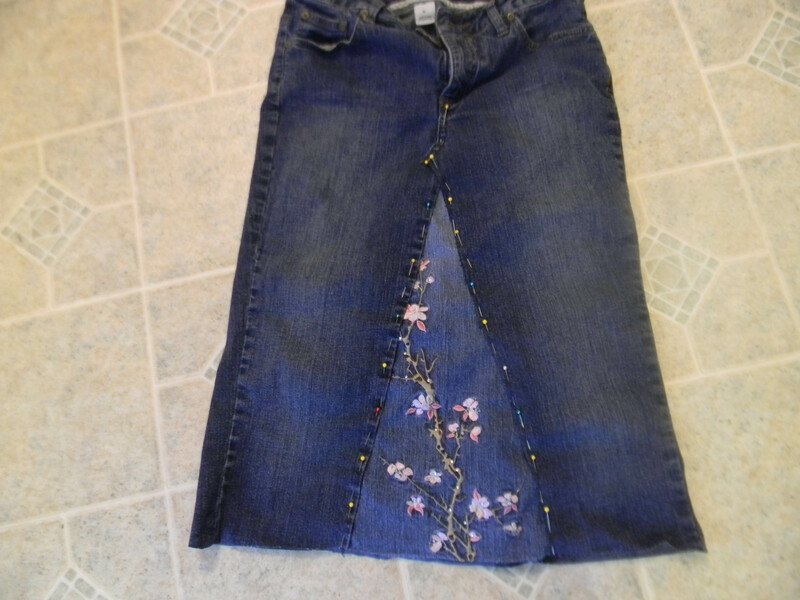 I began with a pair of capris and my expensive, too small, beautiful embroidered jeans. 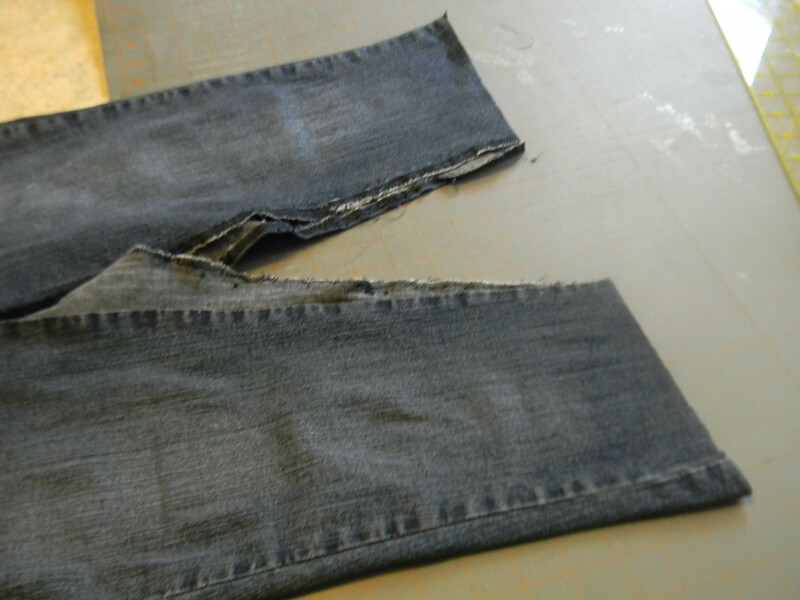 I first took out the inside seam of the capris and then the jeans. For the capris that were the main skirt I also took out the seam up to the front zipper and the seam in the back until the seam would now lay flat. 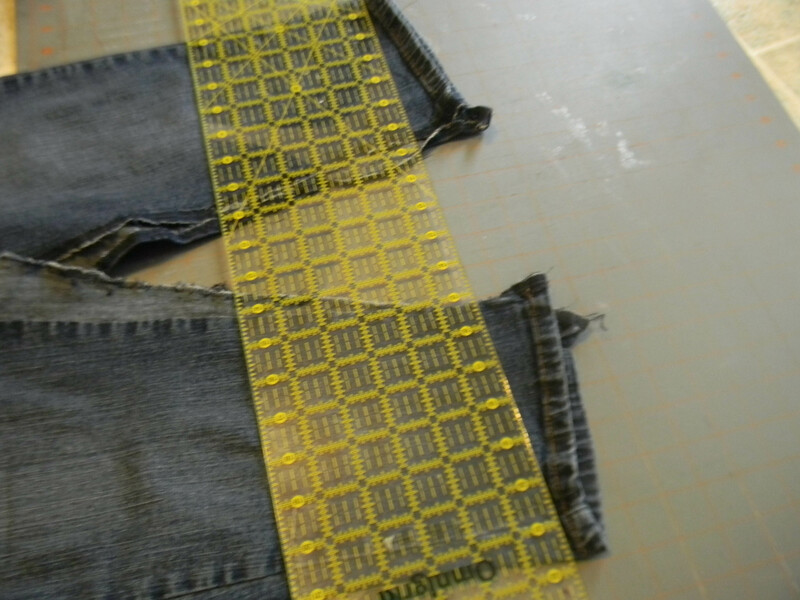 I zigzaged all the edges so they wouldn’t fray and then layed these two seams flat and pinned. 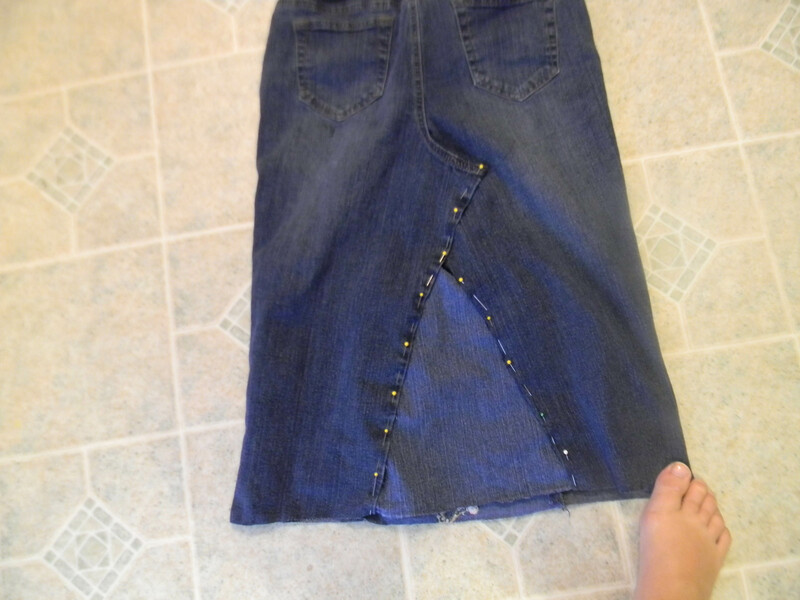 Next I layed the skirt flat and cut the hem straight. 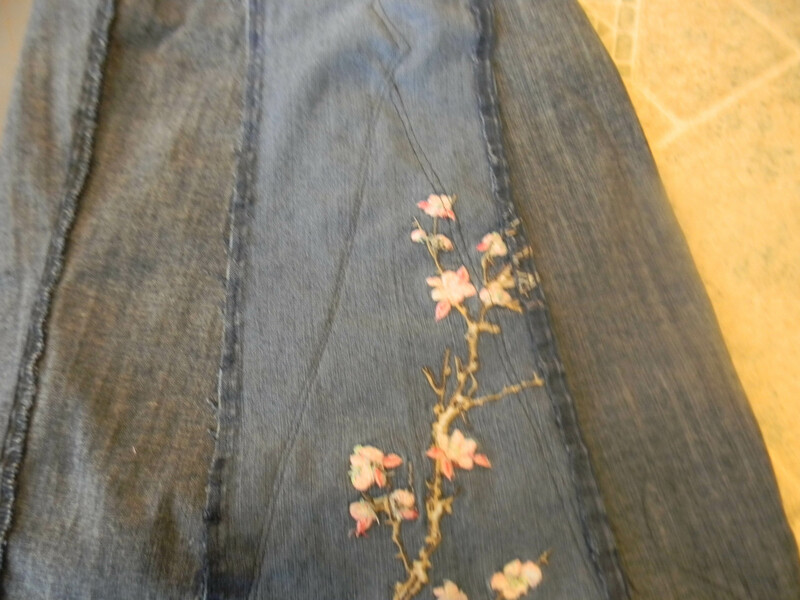 I then fitted the embroidered jean leg into the open area and pinned this in place. 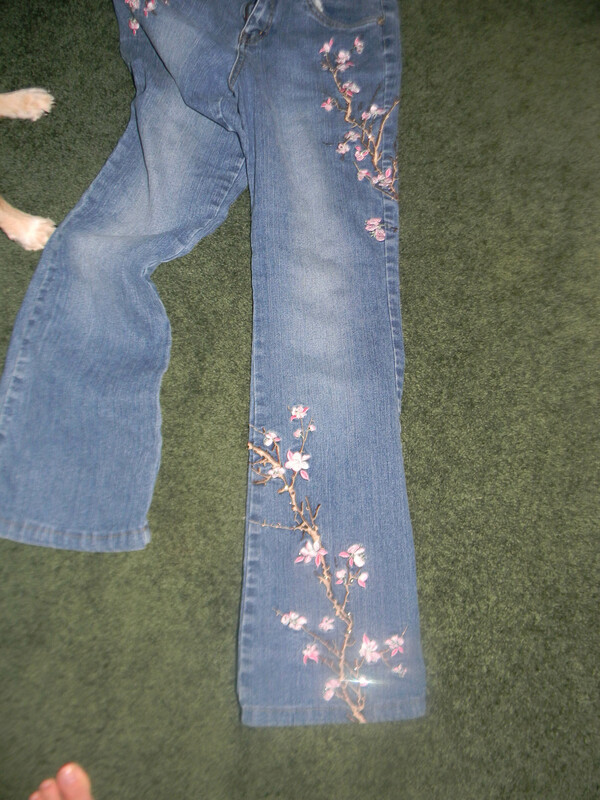 I used the emboridery for the front piece and a plain piece for the back. 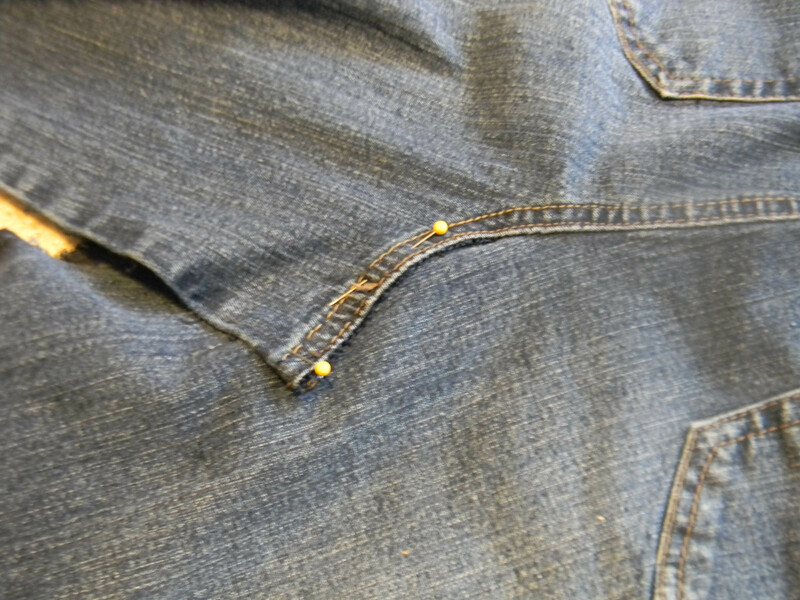 I sewed these pieces in place with two rows of stitching. You could also use a double needle if you wanted. 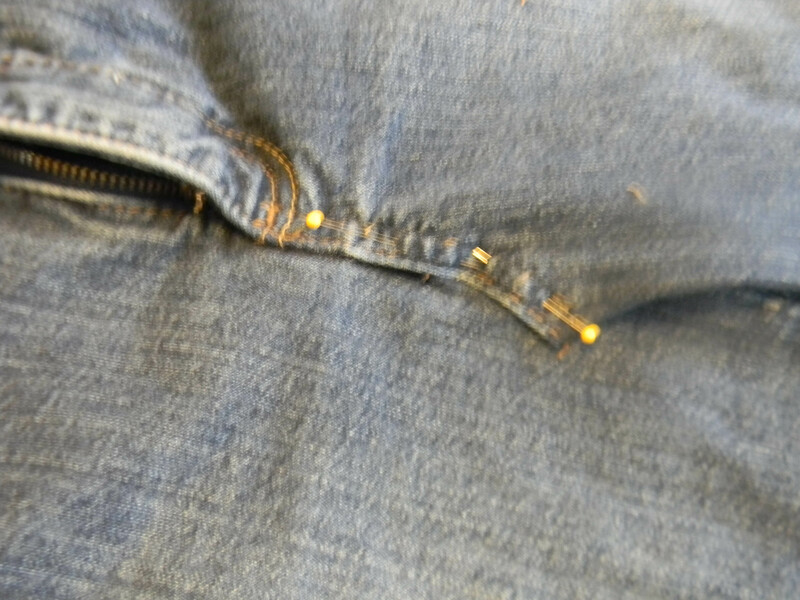 I sewed mine with dark blue thread but you could purchase jean thread and sew your seams with that. Next I turned the skirt inside out and cut the extra fabric but left about an inch so I could zigzag the edges so they wouldn’t fray. I finished the hem and skirt completed! Now on to my next project. 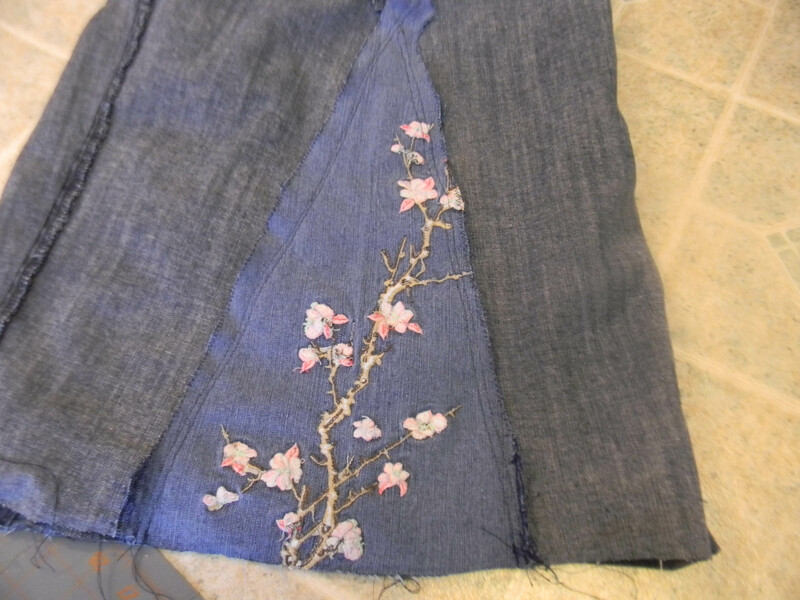 This entry was posted in Posts, Sewing and tagged reconstructed jeans, recycled jeans, sewing. Bookmark the permalink. 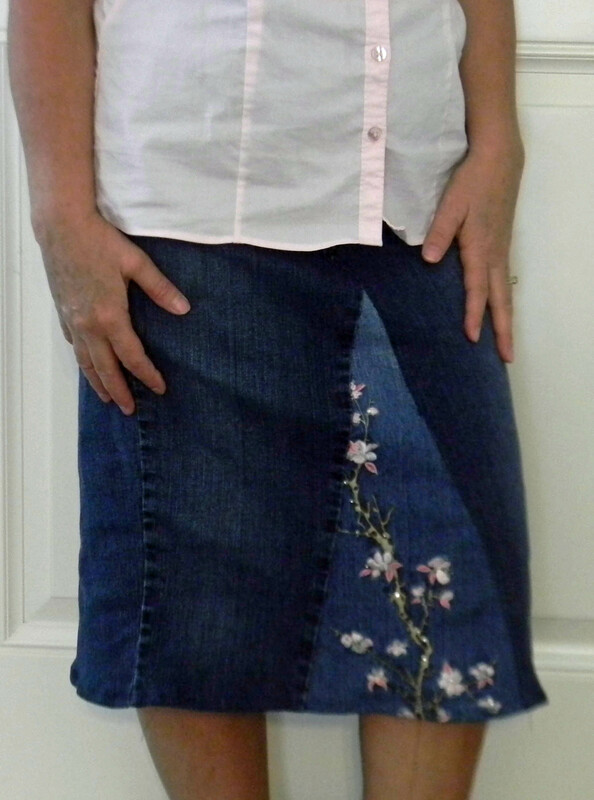 This type of skirt was “in” when I was young so they have been around a while, lol.